Welcome to Helvellyn Cottages in Glenridding. Our cottages are two adjoining old miners cottages situated above the village of Glenridding by Ullswater on the bridlepath leading to the old Greenside mine (now the Helvellyn YHA). Each holiday cottage sleeps 4 people and offers excellent Lake District self catering accommodation in traditional Lakeland stone cottages but with all the mod cons like full central heating, satellite TV, wood burning stoves, washing machines and power showers. Number 1 Helvellyn Cottage sleeps four people in a double and twin room, and there is a fully enclosed garden attached with views towards Ullswater and over the fells. Cottage Number 2 also sleeps four people in a double and twin room and although it has no separate garden is flanked by the fells on either side. Well behaved pets are welcome in both our Lake District cottages, with a multitude of walks straight from the door. Please note that both of our Glenridding holiday cottages are non smoking. Click for more on our Glenridding Cottages. The holiday cottages are located above Glenridding. with stunning views to the front of the foothills of Helvellyn. Glenridding is in an ideal location in the heart of the Lake District, newly anointed World Heritage Site. It lies at the foot of Helvellyn, and next to the beautiful Ullswater, England’s second longest Lake. There are a range of good pubs and restaurants in the village and nearby Patterdale, with the nearest being just 500 yards from the cottages. There are also a good range of local shops. The holiday cottages are just 20 minutes drive from Penrith, Windermere, Keswick and Ambleside. 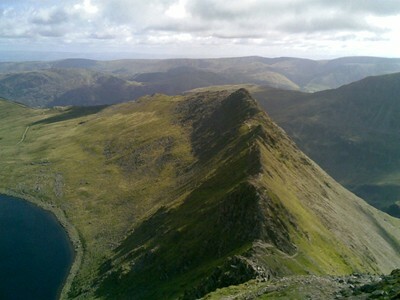 As well as Helvellyn itself, the fells High Street, Place Fell, Fairfield, Sunday Crag and Dollywaggon Pike are all nearby. Click to find out more about our Lake District Location. As the owner of Morgan the black Labrador, we are very pet friendly. Dogs are welcome at all our Ullswater holiday cottages. 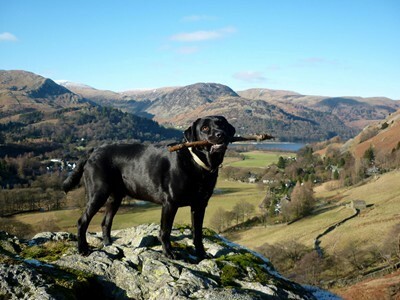 Click for more on our Pet Friendly Lake District Cottages. Please contact us to check availability or for more details on any of our holiday cottages. We offer short breaks in the low season and often have other special offers and last minute deals available. Prices range from £350 to £750 depending on the cottage and time of year, with short breaks available from just £350. We look forward to welcoming you to Helvellyn Cottages in Glenridding soon. We also have a cottage in Patterdale available. The How sleeps 3 people and also welcomes pets. We last updated our Availability on Tues 16th April 2019.